“Know thou that all things in all times, by the command of thy God the Almighty, ‘begin’ and ‘return. But the return which is the purpose of God and which was written in His Holy and Sacred Tablet, and which foretold His servants concerning it, is the ‘return’ of the creatures at the Day of Resurrection. This is the cause of the ‘return as thou hast seen in the days of God, and wast of those who testify. By His command this ‘return’ is to be recognized of those whom He wisheth to be known. Verily, He is the One who doeth what He desireth. Look thou not regarding this position into limitations and names. See thou when the Point of Beyan appeared (the Bab, glory be to him), how he decided that the one who believed first was Mohammed, the Messenger of God. “Is it meet for anyone to object, saying, this man is a Persian and Mohammed was an Arab, or, the name of this one is Huseyn and the name of the other was Mohammed? By the Self of God the Most High, No! IN THE NAME OF HIM WHO IS SEATED UPON THE THRONE. This tablet hath descended from the Presence of God, the Ruler of the Names, to the people of Baha, who speak not save that which hath been uttered by the Tongue of Might and Power, and who follow not every lying claimer. These are they who have drank of the wine of faithfulness from the hands of the Providence o£ their God the Mighty, Chosen. Ye shall hear the voice of a croaker; heed ye him not. Leave him alone and advance toward the Kublah (Center) of all horizons. All preceding Manifestations were ended in this Manifestation, which hath appeared in truth; and all preceding lights have merged into this horizon, from which the Sun of Might and Glory hath dawned. Blessed is the soul which educateth the creatures in accordance with the commandments of God which have been written in the Books and Tablets. Say: If every day a Manifestation were to appear the command of God would have no effect in the cities and countries. This is a Manifestation, the like unto which shall manifest Himself but once in five hundred thousand years. Thus have we uncovered the veil and have lifted up the curtains. Blessed is he who knoweth the purpose of God, for he who comprehendeth it, his heart shall rejoice and his steadfastness in the Cause of God would be in such wise that none in the universe can lead him astray. In this tablet we have uncovered a secret of the Mysteries of this Appearance and have secluded that which ought to be hidden; other­wise, the clamour of the wicked would be raised up. By God the truth is; none knoweth this save the one to whom it was decreed. If anyone should attain the fragrances of this Garment (Manifestation) he would be attracted in such wise that he would be elevated above the contingent worlds. Should we fully explain what we have uttered in this tablet, pens and ink would not suffice. Having this unimaginable and Supreme State, yet thou nearest what those who are led ‘ astray say against Him. We have unveiled for thee one of the secrets as a favor upon thee, that thou mightest thank thy Lord the Mighty, the All-Wise. Oh, My Name, we have uttered in most of the tablets that this Cause is Great and Great, yet none hath comprehended its Greatness, but those whom thy God the Mighty, the Generous, hath chosen. We have abandoned the people of superstitions in the wilderness of selfishness and lust, occupying themselves with that which they have of imaginations. Verily, thy God is Self-Subsistent and Supreme. The Standard of “There is no God but He,” hath been raised up; still they speak that which they have heard from the vile and worthless. We hereby give thee tidings of the Word which appeared in the Garment of Splendor between the earths and the Heavens. Say: Praise be to Thee, 0 Thou whose bounty hath surrounded me and hast promised me with such a promise not before vouchsafed to the righteous. Enow thou that the, Tablet of Ahkam (commandments) hath descended from the Rising Place of Inspiration of thy God, and we, in truth, will send it as a command from Our Presence. Verily, thy God is the Exalted, the Chosen. We have uttered for thet a, tablet before this one and have sent it from another place, that thou mightest ascertain that the promise of God hath preceded every other promise. We ask God to help thee in [spreading His Cause and to confirm thee in. that which He wisheth and desireth in all times. Verily, the Beha is upon thee and upon those who spoke with what was uttered by the Tongue of Knowledge in the contingent world; that there is no God but He, the Powerful, the Exalted, the One, the Single, the Supreme and the Mighty. My greetings are upon my friends, who believed in God the Mighty, the One. HE IS EXALTED ABOVE ALL THOSE WHO ARE UPON EARTH AND IN THE HEAVEN. Still the Voice of God is ascending and the Light of His Appearance from the horizon of the Mount is shining and reflecting; yet the clouds of darkness shall come after this light, and the mists of hatred shall follow. In those days the rays of The Sun of Truth shall be stopped from shining, but at last its light shall victoriously reappear, the Cause of God shall spread and His Command shall be exalted. We command the followers of El Hack (Glory be to Him) to be faithful, pious and to do that which will contribute to the progress of the world and to the elevation of the Word of God. Oh, people of God, it is meet for you to only display the exaltation of God by making your actions, movements and steadfastness as mirrors of His Will. Always “This Oppressed One” commands the seekers and the friends to do that which will cause development and elevation. Every existing atom beareth witness that He seeketh naught for Himself. Praise thou “The Ancient of Days,” for He mentioned thee while He was surrounded and harassed by the attacks of nations. We ask God to sustain thee and the people of that country, to confirm you in praising and mentioning Him, and to grant unto you the Wisdom and Knowledge. Verily, there is no God but He, the One, the Commander, the Ruler, the Mighty and the Generous. Consult the council, and do thou according to its behests, for in numerous tablets have we commanded all to establish the council. We ask God to help thee and His people to do what He wisheth and desireth, and we ask Him to pardon thy parents and all those who have returned unto Him, for He is the Most Merciful and the Creator of those who are in the Heavens and upon the earth. IN MY NAME, WHICH SPEAKETH IN THE KINGDOM OF KNOWLEDGE. Verily, El BEHA mentioned thee at the time when the lamentations and sorrows of His heart were great, because of what the hands of the tyrants had wrought against Him. Verily, the croaker hath uttered his evil voice and the tyrant hath risen for oppression. El BEHA be upon thee and upon everyone who is steadfast and faithful! HE IS THE SUPREME, THE MOST HIGH. The paper was seen and its contents understood. Verily, it is the truth that those who are faithful in the Path of God are few. In this present time the movement of the period of tradition is to be renewed. Shortly many shall follow their worldly lusts, abandoning the Essence of Piety and occupying themselves with that which is naught. Verily, they shall neglect the Aim of the Worlds. This gentle breeze which is breathing from the Spiritual Rizwan shall be stilled and the Morning of Truth shall be exchanged for the evening of falsity. If possible, then, it is meet to shut the eye of criticism and open that of affection; otherwise, cursing and execration, hatred and enmity, shall be renewed as in the past times. Now, this condition exists, yet with loving kindness we treat them. This Epistle is sent to the Followers of Baha’u’llah by Muhammed Husein Shirazi. 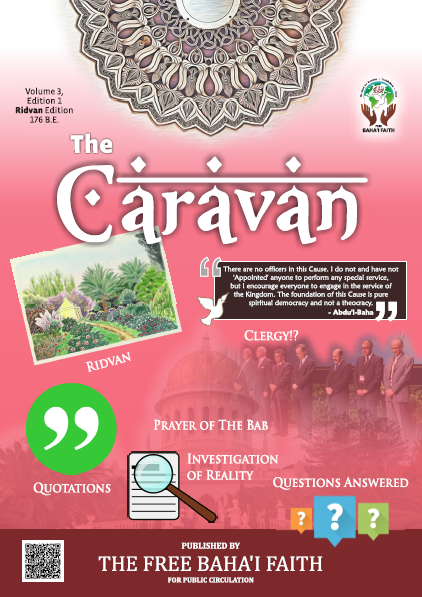 Finally he declared himself to be the one whose appearance was expected by Islam, called by the Shiites “Ckaim” and by the Sunnites “Mahdi.” From the commencement of his work his great subject was the glad tidings of the approaching event, the greatest Manifestation of the Promised and Generous One. He mentioned Him in his utterances with supreme deference, just as John the Baptist spoke about the appearance of Jesus Christ: “I indeed baptize you with water unto repentance, but he that cometh after me is mightier than I, whose shoes I am not worthy to bear; he shall baptize you with the Holy Ghost and with fire.”—St. Matthew, 3-11. Sheik Ahmad-al-Ahsai, a great, learned man, who appeared in the thirteenth century A. H., had foretold the coming of the “Bab” and taught his disciples and the people to expect the coming of the “Ckaim” at any time. After the death of this Sheik one of his disciples, Haji Seyyid Kazim- el-Reshti, who was as profound a student as his master, took his position and at once began to teach and preach openly the approaching appearance of the “Ckaim.” He gave many explanations of the sayings and teachings of his Sheik concerning that appearance. On his deathbed he urged his disciples to start at once in search of the promised One. These two learned doctors have written many things on this subject which we cannot insert in this brief account. He frequently said that His Appearance might take place either in the ninth year or the nineteenth—that is to say, 1269 A. H. (1853 A. D.), or 1280 A. H. (1863 A. D.). The “Bab” continued to give these glad tidings to the people from the beginning of his mission until he was executed in the city of Tabreez, the capital of Atherbijan, in 1266 A. H., on the 28th day of Shaban—that is, 1850 A. D., July 9th. Baha’u’llah, since He declared Himself, has conclusively proved from all Scriptures that He was the Promised One. He has uttered tablets and written epistles which attracted the hearts and refreshed the souls. The noble life he lived astonished and impressed the people, and His fame spread to all countries. All who knew Him acknowledged His Supremacy and were awed by the loftiness and greatness of His character. “Psalm 24, 7-10. Lift up your heads, 0 ye gates; and be ye lift up, ye everlasting doors; and the King of Glory shall come in. (8.) Who is this King of Glory? The Lord Strong and Mighty, the Lord Mighty in Battle. (9.) Lift up your heads, 0 ye gates; even lift them up, ye everlasting doors; and the King of Glory shall come in. (10.) Who is this King of Glory? The Lord of Hosts, He is the King of Glory. Selah. “Isaiah, 4—2. In that day shall the Branch of the Lord be beautiful and glorious and the fruits of the earth shall be excellent and comely for them that are escaped of Israel. Also, Psalm 50, 1-3; Psalm 108, 10. “Baha’u’llah called Himself ‘the Branch’ in many off His Tablets, and I have seen some of them in His own handwriting. “Isaiah 28, 5-6; Isaiah 33, 16. He shall dwell on high, His place of defence shall be the munitions of rocks; bread shall be given Him; His waters shall be sure. “Isaiah 35, 1-2. The wilderness and the solitary place shall be glad for them; and the desert shall rejoice and blossom as the rose. It shall blossom abundantly and re]oice, even with joy and singing; the glory of Lebanon shall be given unto it, the Excellency of Carmel and Sharon, they shall see the glory of the Lord and the Excellency of our God. “Isaiah 40, 3-5. The voice of Him that crieth in the wilderness, ‘Prepare the way of the Lord, make straight in the desert a highway for our Lord. Every valley shall be; exalted and every mountain and hill shall he made low; and the crooked shall be made straight and the rough places : plain. And the glory of the Lord shall be revealed and all flesh shall see it together; for the mouth of the Lord hath spoken it. The seventh verse of the 52nd chapter of Isaiah is considered to be a prophecy concerning the Bab when he was imprisoned in the mountains and gave the tidings concerning the appearance of Baha’u’llah. It is said that the messenger of the Covenant is the Bab, who gave tidings of the appearance of Baha’u’llah, took His Covenant and prepared the way before Him. He is Elijah the Prophet, who was mentioned in the 4th chapter of Malachi. Baha’u’llah plainly declared in many of His well-known tablets that the Bab was Elijah. In His writings, Baha’u’llah uttered numerous texts emphasizing these great principles. They are full of significance, and those who hear them cannot but feel deeply impressed. They compel every just soul to testify to His Supreme benevolence. We shall quote some of them, in accordance with the necessity of our subject. One of the most important points asserted in his writings is that there cannot be a true Manifestation (a prophet) before the completion of a full thousand years from his appearance, and if anybody should claim to be a prophet no one ought to believe in him, even though he could utter the texts. For this reason, if every now and then other Manifestations should take place, confusion would follow and the Word of God would lose its effect and no good results could be attained there­from. The Holy Law-Giver has in every Manifestation a Supreme infallibility. His command is the command of God. His words are the words of God, and no other besides Him has any such authority. Everyone should abide under His shadow, follow His commands, and be responsible for his sayings and actions according to His laws. He who rises after Him for the helping of His work must spread His Word and practice His commandments; and his position ought to be that of absolute servitude. He has no authority to change a single letter of the commandments contained in His Books. In His writings alone is to be found the true balance, the supreme test. In every ease those who differ must consult His Books for a decision. He ordered His followers to consult and study His utterances upon all occasions, and especially whenever they might differ upon some question after His departure. Of His utterances are these: That His Sons are the finger-posts pointing toward Him, and the executors of His command. They are controlled by His laws, but have no power to change one letter of His commandments. They have the highest position among His followers; and all must honour and respect them, appreciate their position, and obey them, so long as they work in the Shadow of His Word and in proper servitude of His law. He gave utterance, in several epistles and tablets, to many admonitions for His people. He commanded them to live in concert and love each other, and to deal with people of all religions in a spirit of unity and friendliness. One of the great events of His days is, that after His arrival at the prison of Acre He sent with one of His friends an epistle to the Shah of Persia. The bearer, who was in the prime of youth, delivered the letter to the Shah while he was on a hunting expedition. In that epistle Baha’u’llah asked the Shah to call Him and the most learned doctors oil the empire together, in order to discuss His claim and the differences between His teaching and that of the Shiites— this meeting to be held in the presence of the Shah. This is considered a wonderful thing, for the Shah was a powerful one, and the doctors were all bitter enemies of Baha’u’llah, and at the same time their word was law to the Shiites, who submissively obeyed all their commands. Therefore, His request to hold this conference must be regarded as a conclusive proof of His sincerity and of His ability to substantiate His claims in every particular. One of the strongest evidences which Baha’u’llah has embodied in some of His epistles as proof of His claim was the martyrdom of those followers of the new religion, who were so persecuted in His country, and although slaughtered in the cruellest manner, were faithful to the end. These tragedies resemble those which took place amongst the early Christians, but it is said that the people of our time are even more faithful and devoted, for some martyrs of our day have killed themselves with their own hands out of devotion to their Lord. Some of the murdered women and children displayed a devotion, the like of which has never been heard of in the past ages. We can but mention these events in this brief article, but should anyone desire to know the details, let him ask to see the Book of Martyrs. It is a well-known fact that differences of thought, dissensions, have taken place in every religion that has appeared in this world, either in the day of the Law-Giver or after his departure. This is proved by the histories of past ages. It is an event which has always happened. In such cases the wise will judge the different thoughts by the just judge, the Book of the Law. They will approve of that which is in perfect accordance with it, and reject that which differs from its teachings, even though it came from a high source. For the true and only judge is the Book by which everything, every case and every thought must be justified. Let us now proceed to give a short account of what happened after the departure of Baha’u’llah. His followers differed among themselves regarding very important questions in His teachings. Such dissensions have occurred in all ages, because those who have ambitious aims will at once, when they have the opportunity, begin to sow the seeds of corruption in the hearts of the people, and thus gain for themselves supremacy and riches. But to return to our subject. The oldest son of Baha’u’llah, Abbas Effendi, together with some relatives (not by blood) and other designing persons, have intrigued in a rather peculiar manner to gain personal benefits and the most absolute supremacy. But they found obstacles in their way, the greatest of them being the writings of Baha’u’llah, which are widely spread in many countries. These utterances contain that which will deprive them of authority, disappoint their hopes, and refute their claim. Another important obstacle is the three Branches and the family, for they will never agree to disobey even the slightest command contained in the books of Baha’u’llah. In short, Abbas Effendi claims the power of knowing the inner and a divine attitude, and explains this in different and ambiguous ways. Thus they have planted the seeds of doubt in the hearts of those who have not sufficient knowledge of the utterances of Baha’u’llah, and but little understanding of His teachings. One of the seeds of corruption which he sowed in the hearts of many is his claim that he is the Manifestation of the Only Son of God—that is to say, the Lord Jesus Christ while all the Holy Books plainly prophecy of one Manifestation only—i.e., that of the Everlasting Father, the Eternal God. Abbas Effendi claimed this in order to induce Christians to accept him as sole authority. Indeed, he does not desire that the Supreme Position of the Father should be acknowledged. His policy is to please those people around him. After they come under his absolute control he will claim for himself every supreme attitude—that there is none beside him—as he has already done among his immediate followers. To keep these people in his power he has tried by every means to prevent them from reading the works of Baha’u’llah, which would show them plainly the falsity of his claims and teachings. These works would make them aware of the harm which has resulted in the past from holding to false doctrines, for they lead back to barbarism and have ever been a hindrance in the way of civilization, knowledge and science. Briefly, we may say that some people were seduced by his honed words to believe in the truth of his claims and follow his teachings, which are full of superstition and distorted imagination. In the beginning the claims were not made openly, but merely hinted at vaguely, but when he and his supporters discovered that the wise among the believers did not oppose them and kept silent — this they did, fearing to start disturbance and dissension—they were encouraged and with extreme boldness showed forth their false pretensions. Then those who were wise, faithful and upright rose up in defence of the true faith given them by Baha’u’llah, and from the epistles of their Lord, clearly proved the strength and justice of the stand they had taken. Those who were trying to lay a foundation upon which to build their supremacy found that this uprising of the honest and sincere believers would be in the way of their interest. They knew that if their simple-minded followers were al­lowed to meet with the pure in the faith and discuss the differences they would be awakened to see the truth, for the proofs of the truth are from the striking words of their Lord, Baha’u’llah. Fearful of the result, Abbas Effendi has prevented and prohibited his followers from speaking to or associating with those who will not blindly obey him, and thus laid the foundation of enmity and revived the barbarian creed, that to associate with those of different faith is a cause of sin and uncleanness. Even now the party of the younger Branches and the family of Baha’u’llah still invite those people to follow the commands of their Lord—i.e., to associate with all in a spirit of friendliness and kindness. But the invitation is of no avail, tor they are getting worse and worse in their attitude of unfriendliness and enmity.